Technology unfurls at an incredible rate. Not even ten years ago, there was no such thing as a smartphone. Mobile technologies have revolutionized the world of work and the world in general. A more current technology is cloud computing, which promised to be the next big wave of progress. How about artificial intelligence cloud computing? The two technologies are in use together. There are more advancements predicted for the near future. Right now, AI only accounts for 1% of the global cloud computing market. But its share of the IT market is growing by 52%. Artificial intelligence isn’t new, but it is mirroring human reasoning with striking precision. Businesses are on board with the technology. This has implications on how we all work, and how we all live. AI makes it possible for machines to act like humans. They can think, learn, and react. AI machines learn from existing data. They identify patterns in new data and make decisions in real time. Some say this will lead to full automation of some processes. In theory, this automation has the potential to eliminate human errors. The current focus of AI is developing small applications or services that perform a discrete task. The program will work for you and improve your day-to-day tasks. This could include helping you shop for groceries, navigate to your destination, or even find a romantic partner. And of course, you have most likely had your own conversations with either Siri, Alexa, or Cortana. AI gets better over time as it learns your needs and preferences. It adapts and evolves to better serve its purpose. AI gets to know you in a very literal sense. 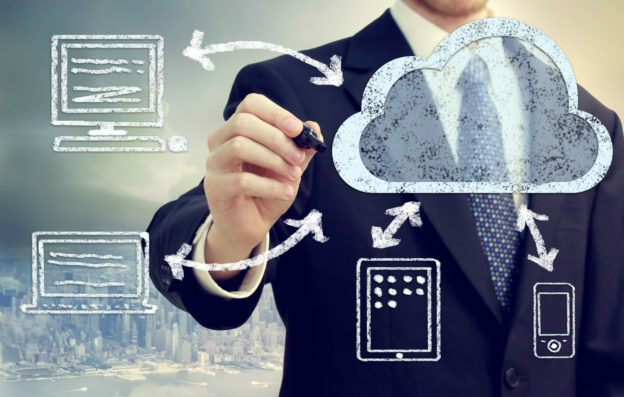 According to the U.S. National Institute of Standards and Technology (NIST), cloud computing is a model that allows a convenient, on-demand network to access to a shared pool of configurable computing resources. These resources include servers, networks, applications, storage, and services. The cloud can activate and release these resources with service provider interaction. Cloud networks are ubiquitous, or present everywhere, yet have a high level of transparency. Cloud computing delivers on-demand computing via the internet. Cloud systems are able to run software on virtual machines. Those virtual machines can be activated on-demand and stored in large data centers. Companies can provide cloud services through large networks of new data centers that connect to existing data centers. This allows a provider to create new virtual computers as user demands increase. It can then free unused hardware sources as user demand decreases. Artificial intelligence (AI) technology is already augmenting the current cloud platform. It can also fuel a new generation of cloud computing technologies. As consumers, you are probably familiar with the simple customer service chat applications. That is one small example of AI application. Other examples are the self-driven car, facial recognition programs, and medical assistants that aid in diagnostics. AI and cloud computing are changing the landscape of the corporate world. Artificial Intelligence has the potential to further streamline the immense capabilities of cloud computing. Artificial Intelligence equips cloud computing with tremendous power. AI and cloud systems are symbiotic. One service complements the other. AI works by hashing large amounts of data and then comparing it to stored data. AI algorithms serve to add new knowledge to existing data. Such processes would overload a typical personal computer. In fact, complex AI tasks often need expansive resources or datacenters. With cloud technology, AI tasks spread across data centers. This is a big reason why an accessible cloud is the perfect complement for AI tasks. Combining the two technologies means AI systems can perform more complex tasks with less centralized hardware. Once AI is no longer bound by hardware configuration, more data is available. More data and more computing power mean endless possibilities. AI experts say that the technology will have increased functions as early as this year. Accelerating technologies like big data and AI are coming together now. The prediction is that it will trigger major changes for all of us. Given all the possibilities, AI is set to become as ubiquitous as well. There is use for artificial intelligence cloud computing everywhere. Wherever AI can accomplish decision-making, AI can go through the cloud. There is a need for real-time decision making. So, AI cloud computing is on its way to being a solid need for cloud providers. AI leaders are three familiar names, Amazon, Alphabet (Google), and Microsoft. Each has discovered that their AI products they use for themselves can also be sold as a service. These three companies and other cloud providers are providing AI cloud services. This makes artificial intelligence cloud computing more readily available to corporations. AI as a service means that businesses can create innovative solutions to fit their needs. Alphabet, whose subsidiary is Google, began delving into AI in 1999. This was the year Google made the statement that it used AI in Google Search. Google decided to expand its cloud computing business to serve enterprise customers. Google Cloud storage launched in 2010. The aerospace industry uses Google’s image recognition programming. Image recognition enables them to process large volumes of satellite imagery. Google Translate is now available for global business call centers. Amazon sells its artificial intelligence cloud computing services to countless industries. Their services include fraud detection, demand forecasting, facial recognition, and translations. And of course, there is Amazon’s line of echo devices featuring Alexa. Alexa has changed the game for home automation and commerce rolled into one. Alexa’s success has enabled Amazon to offer the technology behind Alexa as its own product. Most of Microsoft’s business serves enterprise customers. They are focused on turning AI into revenue. In August 2017, Microsoft released a real-time AI system for its enterprise cloud customers. They can sell this release to companies who want to deploy dynamic pricing and retail personalization. Microsoft’s mission is to help companies be more productive. That means Microsoft is the company whose AI work may be the most innovative in the future. The artificial intelligence cloud computing has revolutionized the way people interact with the Internet and data storage. And this technology is still in its infancy. Imagine where companies like Amazon, Google, and Microsoft are going to take it. If you are considering AI cloud services for your company, please contact us.